The vacuum cleaner is a key weapon in a janitor’s arsenal. There have been a lot of changes to this key piece of equipment since its invention about 100 years ago, and technological advances continue to improve ease of use, efficiency, and effectiveness. Lately, there has been a lot of talk in the jan/san industry about backpack vacuums. First, there were corded versions with limited maneuverability. Then came battery-powered vacs that were heavy and had short run times before recharge was needed. Today’s cordless machines, however, are lighter, run longer, and are more affordable than previous offerings. 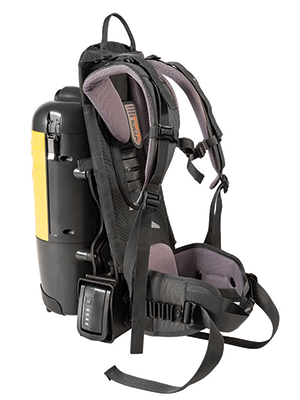 A backpack vacuum includes a harness, in some cases ones designed by pack back hiking companies, worn over the user’s shoulders, a vacuum that rests on the back, and a handheld hose and wand. Not sure if this configuration trumps a traditional upright vacuum for your needs? Every BSC and facility manager has different cleaning needs, so consider whether the benefits make sense for your buildings and staff. 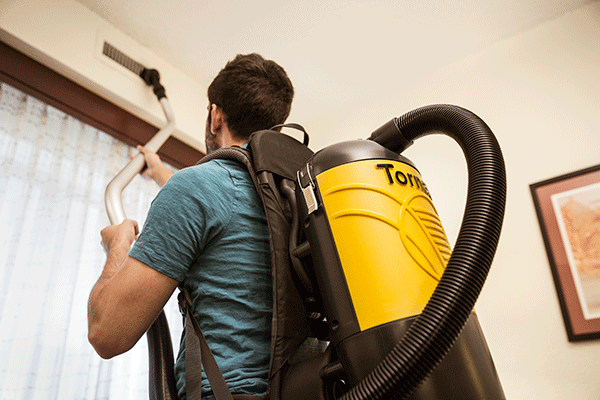 Cordless backpack vacuums are nearly 4x faster than an upright and 30% faster than a corded model! COST: Battery backpacks can cost two to six times more than a basic upright vacuum, so buying an entire fleet can represent a sizable capital outlay. The upfront costs can be recouped fairly quickly, however, in labor savings from productivity gains (as well as reduced maintenance costs). BATTERIES: Batteries are primarily responsible for the higher upfront costs of this style of backpacks. A typical battery works for an hour; to keep janitors from waiting 2-3 hours for a recharge, larger facilities may buy an extra battery for each unit. Wall-mounted charging stations can also add to upfront expenses. Most backpack batteries can handle 300 or more recharges before new batteries must be purchased. PRODUCTIVITY: Depending on the size of the carpet tool attachment, a backpack vac can clean 7,200 to 10,000 square feet per hour, according to ISSA’s 540 Cleaning Times. It drops to 2,200 to 5,000 square feet with standard 12- to 24-inch uprights. Clearly, productivity gains will be the most substantial for the largest facilities. MAINTENANCE: Backpacks lack some of the parts that can cause problems in uprights. They don’t have belts or beater bars with brushes that need frequent replacement, nor bottom plates that can come loose and be damaged. Also, backpacks’ hoses are quite wide and less likely to clog than uprights’. EFFICACY: Backpacks have more suction power than uprights, allowing them to pick up more dirt. They are less bulky and cord-free, so they can easily clean tight or awkward spaces like stairs and elevators. They can be used on all types of floor surfaces, from wood to carpet to vinyl. And they can tackle edging, dusting, and specialty work like cleaning vents and blinds. ERGONOMICS: While battery backpacks can weigh up to 20 pounds, with the proper harness the weight is distributed evenly over the hips. 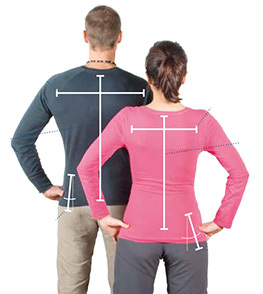 Uprights must be pushed back and forth, a repetitive motion that can damage the wrist, elbow, and shoulder joints (and can also lead to lunging that harms the back). With a backpack, free-flowing side-to-side movement is less stressful on the body. Think the upsides of battery-powered backpack vacuums justify the price tag? There’s one more consideration—employee buy-in. Any new tool or product can be met with reluctance, especially when it represents a dramatic shift from conventional and familiar methods. Before changing from upright to backpack vacs, discuss the potential benefits; be honest about any drawbacks, and share why the change is being made. Involve employees in testing the various models, and then hear and consider their feedback. After the purchase, fit each custodian individually, encourage them to watch manufacturer videos and/or attend training, and remind them of the benefits of the equipment for the facility and for them. In a few weeks, follow up for feedback and to make sure janitors are using the backpacks correctly. Within a few weeks of their introduction, battery-powered backpack vacuums are not only accepted by custodial crew, but often become a favorite tool. 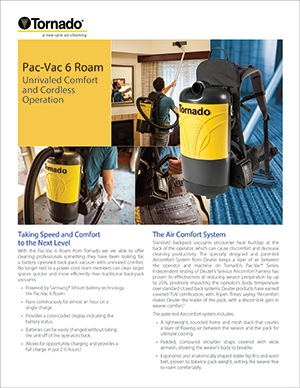 The Pac-Vac 6 Roam from Tornado offers cleaning professionals something they have been looking for, a battery operated backpack vacuum with unrivaled comfort. Tornado Industries does more then sell equipment. We help solve facility cleaning challenges.